By 2001, the molds colonized in the cave were forming a white mass over the floors and ledges of the painted chambers. Authorities began spraying massive doses of antibiotics and fungicides in an effort to stop the rapidly spreading organisms. Within weeks the molds reappeared quickly developing a resistance to the antibiotic sprays. Realizing that the air-conditioning system was ill fitted for the cave and was indeed part of the problem, authorities shut down a major portion of the newly installed system. In the fall of 2001, authorities began to pour in Quicklime (Calcium oxide [CaO]), commonly known as lime, quicklime or burnt lime, a widely used chemical compound. It is a white, caustic and alkaline crystalline solid, as well as a refractory and dehydrating agent. In 2001, in an attempt to kill the fungus Fusarium Solani inside Lascaux, authorities poured four tons of quicklime on the cave's floor in a very aggressive and controversial move, hoping to stop the advance of the molds and fungi. This created a rise in the cave’s internal temperature and quickly destabilized the interior hydrometric balance of the cave. These higher temperatures dried up the air of the cave causing moisture to form on the cave's walls; the moisture washed off some of the prehistoric pigments. While this measure is intended to stop the spreading of molds and fungi, it also raises the internal temperature of the cave as the quicklime virtually suffocates the cave floor. Compresses soaked in a mixture of fungicides and antibiotics are then applied like bandages to the walls and ledges of the cave in a further attempt to control the growing organisms. The fungi and molds had retreated by the summer of 2002 but bacteria were still growing in large dark spots inside the cave. Authorities then resorted to a mechanical removal of the roots of the bacteria. This method is highly invasive and unending. The damage inflicted on the cave by having crews constantly inside physically removing the roots, coupled with the brown spots that remain and are highly visible, is not a viable long-term solution to save the cave. -- the invasive extraction of the roots of the Fungus: Any one of the members of the thallophyte division such as mushrooms, molds and mildews, which subsist on dead or living organic matter. 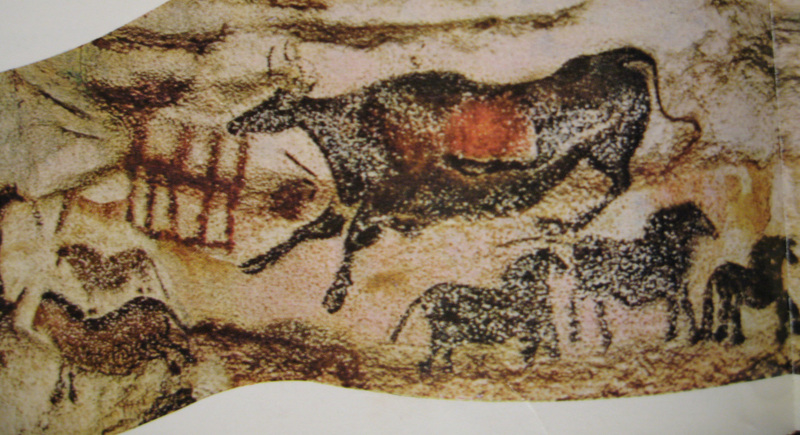 There are other problems; not only is Lascaux threatened from the interior, but also from the exterior. The placement of the car parking lot for Lascaux II [a recent simulacrum of part of the cave] appears to sit directly on top of Lascaux. There are important concerns about how the material of the car park, the weight of the cars, the emissions of the cars, etc., are impacting the cave beneath. To date, the French government has been ineffective in its handling of the crisis inside Lascaux. Four different departments are charged with the care of the cave with no one authority held accountable. There is overlap and a real failure by the authorities charged with the cave’s well-being to judge the situation in its severity. There is no independent international oversight. Unless change is undertaken quickly, the world stands to lose Lascaux’s irreplaceable masterpiece and its rich story of mankind’s place in time. Nice article. Lascaux is a must visit for Paleolithic cave paintings. The basic designs consist of huge animals. You can see around 2000 figures in this cave. The figures are divided into animals, human beings and abstract things. The Great Hall of the Bulls is very famous. The painting of four huge bulls is amazing. The best time to visit this caves is between July and August.